Hot roadside snacks in Delhi could soon be a thing of the past under a plan to clean up the Indian capital's streets. 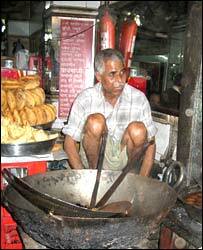 The Supreme Court has passed an order to ban the cooking of food at stalls along the roadside. More than 300,000 hawkers could be forced to close their outdoor kitchens if the rules are enforced. The authorities are concerned that most street food is cooked and served in unsafe and filthy conditions and want it cooked at home and sold pre-packed. Chandni Chowk, a market street in the heart of Old Delhi, is the ultimate foodie's delight. Every few metres you pass stalls piled high with deep-fried offerings of savoury parcels filled with green peas and hot chapattis or spicy chaat - a dish that's unique to Delhi. The simple street eateries are famous in their own right. Many date back to the last century - each has its own recipe and has been in the same family for generations. At lunch time the narrow lanes are packed with hungry customers. Ravinder Jain has run his family business in Chandni Chowk for more than 50 years and his stall attracts more than 100 loyal customers a day. "It's a tradition and way of eating that dates back years." he says. "People come here for the authentic tastes and the range of foods we have on offer - they can't get enough of it." But under Tuesday's court order, street vendors like Ravinder are now threatened with closure. They will have to cook the food they sell at home and serve it pre-packed to their customers. 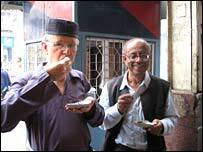 Tucking into steaming hot samosas, Neil George and his friend Mohini Patel seem undeterred by the unhygienic conditions. "The food is cooked right there in front of you - so you know you are safe," Mohini says. "They simply cannot close these stalls - too many people rely on them. The food is cheap, widely available and tasty. Customers don't want to go to restaurants - they want fresh cooked food in front of them." Neil says that for tourists like him the food stalls are a real attraction. "This is life in India - it's a part of the culture we come to see and love and I don't want it to be modernised in a negative way." But the owners of other shops like "Ghantai Wallah's" in Old Delhi are keen to see the industry modernised. The Jain family have had their sweet shop in Chandni Chowk for more than 200 years but as times have changed they have modernised. Sonia Jain says "anyone can come into our shop and buy food knowing that its been cooked in clean conditions - it's like home cooking. "Out there the stall holders are filthy, the food is left uncovered, there are flies everywhere and it's just not nice." India wants to clean up its food-serving image - but Delhi is famed for the diverse range of eateries it has on offer. If the new rules are enforced, the capital could lose a vibrant industry that offers an authentic taste of old India.